Still, there’s no movie I’ve watched more times than the classic golf comedy that was filmed nearly 40 years ago. I had to watch it still again after Chris Nashawaty’s book, “Caddyshack: The Making of a Hollywood Cinderella Story,’’ was released this month. Nashawaty is the film critic at Entertainment Weekly. He liked the movie enough to – by his account – watch the movie 100 times. That more than qualified him to write about the behind-the-scenes making of `Caddyshack,’ and his account left me wondering how the movie ever got made in the first place. “The shocking thing is — with the amounts of drugs and alcohol consumed — that the movie makes any sense at all,’’ said Nashawaty. `Caddyshack’ was hardly an instant hit. It took years for it to be fully appreciated, but the movie – made on a $6 million budget – eventually made $40 million. One notable exception was Roger Ebert, the late, great movie critic at the Chicago Sun-Times. “He nailed it. He really understood what was going on,’’ said Nashawaty. Ebert was in a vast minority. `Caddyshack’ was no `Animal House’ even though those two movies had many of the same stars. Comedy was changing from 1970 to 1980 and those movies were a major proof of that. `Caddyshack’ had a first-time director, Harold Ramis, and a first-time producer, Doug Kenney. Kenney, who had been battling a drug problem, had one of the funniest, brightest creative minds in the film industry at the time. He was despondent over the initial reaction to `Caddyshack,’ and was found dead in Hawaii ravine shortly after the movie was released. Just 33 years old, his death came under mysterious circumstances, though it was eventually ruled accidental. According to Nashawaty’s account, drugs were rampant during the three-month filming of `Caddyshack,’ the cast of which included top box-office stars Chevy Chase, Bill Murray, Ted Knight and Rodney Dangerfield. Nashawaty also included Murray, the famed comedian who played hilarious, gopher-chasing assistant golf course superintendent Carl Spackler in the movie, from the cast members who were not into the drug scene. One of Murray’s brothers, Brian-Doyle Murray, was – with Kenney and Ramis – a leader in getting studio executive to invest in the project. In the early stages of the process Winnetka’s Indian Hill Club was considered as the site for the filming because the Murray brothers had been caddies there during their youth. “They wanted to shoot the film in the fall but they couldn’t shoot (in Chicago) in November,’’ said Nashawaty. California was ruled out because the movie’s personnel didn’t want Hollywood film executives getting involved. The movie was proposed as a fun project, which it obviously was, and a filming location in south Florida, near the Ft. Lauderdale airport, was chosen. “So many golf clubs would not allow a Hollywood crew to trample their golf course in the middle of their season,’’ said Nashawaty. The club was named Rolling Hills Country Club then, but was called Bushwood in the movie and is now known as Grande Oaks Golf Club. Officially located in the town of Davie, Grande Oaks isn’t at all like Rolling Hills, which opened in 1959, or Bushwood. In 1999 it was purchased by Wayne Huizenga, who would later own football’s Miami Dolphins, baseball’s Miami Marlins and hockey’s Florida Panthers. The clubhouse used in the movie was demolished a year after Huizenga bought the club and the course was re-designed by legendary golfer Ray Floyd. The Murray brothers have carried on the Caddyshack memory, opening one popular bar-restaurant by that name at World Golf Village Resort in St. Augustine, Fla., and more recently opening another in the Chicago suburb of Rosemont. 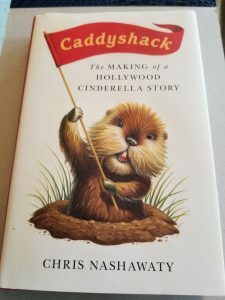 `Caddyshack II,’ a sequel released in 1988, was poorly received but the original is without doubt a cult classic and Nashawaty’s book won’t likely be the last written about it. Cindy Morgan, the actress who played the character Lacey Underall in the original version, has been working on a book that won’t be anything like Nashawaty’s. It’ll apparently be a coffee table book with a lot of pictures. I will be on the lookout for that one.